Possibility of driving LED dies independently allows scanning a broad spectral range. 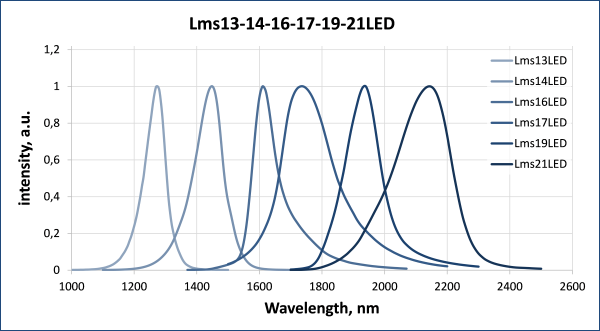 Standard LMSNT 6-element multi wavelength LED array comprised of LED dies with peak wavelengths 1.3, 1.4, 1.6, 1.7, 1.9 and 2.1 μm covers the range from 1.3 μm to 2.1 μm. • TO-8 with a thermoelectric module with a cap (with a glass window) - Lms13-14-16-17-19-21LED-6M-TEM. All parameters refer to LED array in TO5 package and operation at ambient temperature 25°C. *1 Repetition rate: 0.5 kHz, pulse duration: 20 µs, duty cycle: 1%. Especially for operation with matrices with independent driving possibility there was desinged multichannel LED driver MCD.